BML-Viscometer is a coaxial cylinder viscometer for course particle suspension that is suitable to measure the rheological properties of cement paste, mortar and concrete with 80 mm slump or higher. When stiffer concrete is tested the coaxial cylinder unit is replaced by blade impeller system. The rheological properties are described by the fundamental parameters in the Bingham model, the yield value and the plastic viscosity. They are calculated by modified Reiner-Rivlin equation or for concrete, by Plugg equation. One can also choose to use the values G and H instead of the Bingham parameters, and they are often preferred as they are simpler and easier to implement. 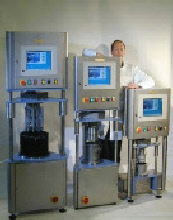 The calculation process also qualifies the proneness of the concrete-mix to segregate by the segregation factor (S), which can be considered as the change in viscosity during testing. The specified performance range of the BML-viscometer is for torque 0,27 Nm - 27 Nm and for rotation velocity 0,1 revolutions per second (rps) - 0,6 rps under normal testing conditions. The absolute range for both the velocity and the torque can be optionally adjusted. For the WO-2 model the rotation velocity range is 0,05 rps - 0,65 rps and the torque range is 0,27 Nm - 28,2 Nm. The later model WO-3, an enhanced version of the WO-2 model, has an extended performance range for rotation velocity of 0,0022 rps - 0,85 rps and torque range of 0 - 60 Nm. The very low rotation velocity of the WO-3 model makes it possible to measure the stress-deformation curve of the sample mix, an important factor regarding consolidation of concrete. 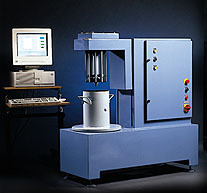 The high torque range of the WO-3 model is absolutely necessary when testing high performance concrete. The ConTec-Viscometer is constructed of heavy gauge steel plates on a steel frame to withstand the environment in cement and concrete production plants or construction sites. Optionally the instrument can be made to operate under temperatures from -15 to +60°C. The total testing time normally takes about 3 - 4 minutes, i.e. the time from filling the outer cylinder until it is emptied again. During this period the concrete is exposed to direct movement for only 75 seconds in a standard test procedure.